Fly above Grand Canyon National Park on a 1.5-hour aerial tour from Cottonwood, and capture stunning views of the colorful Sonoran Desert scenery. Soar above the red rocks and pines along Oak Creek, and take in the vivid landscape of the Painted Desert. 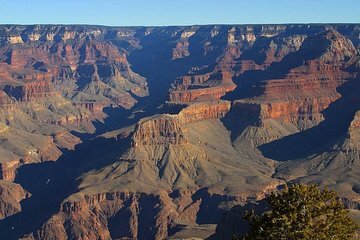 Watch the ground drop away as you bank above the South Rim of the Grand Canyon then look down into the widest and deepest sections of the canyon as you enjoy unobstructed views of the park’s ridges, peaks and cliffs. I booked my flight 3 weeks previous, and as it turned out, I was lucky! Not for the reasons like being overbooked, or popularity of this tour. No, it was the weather. Just like any other flight, it's the weather at your destination, not your departure. When we did fly, it was a wonderful, educational, and awe-inspiring experience. Every seat has a view. The pilot was extremely knowledgeable and pleasant, and as an experienced flyer and traveler, that can be the key to any tour. Highly recommend this be a part of your trip to Sedona and the Grand Canyon. Also the staff at Air Tours Sedona, is friendly and very, very helpful. We should have taken the helicopter ride. The prop blades show in all our photos. The pilot was knowledgeable and friendly. Thanks for the tour. An amazing experience. The staff at the aerial tour company were friendly and professional. A wonderful experience for those who would like to get a sense of the scale of the Grand Canyon from above. It was fantastic!!! Breathtaking and very enjoyable, informative. I would do it again.